How Much Public Space Does a City Need? How much of Manhattan is dedicated to public space? For starters, there’s Central Park, but the island’s oasis is only 1.3 square miles, 5.6 percent of the borough’s land area. You might remember those swaths of green way uptown, like Highbridge Park and Inwood Hill Park (the only natural forest left in Manhattan), but together they’re just another one-half square mile, accounting for a mere 2.1 percent. Add in all the well-worn parks from Marcus Garvey to Bryant, the slivers of open space along the rivers, privately-owned public spaces like Occupy’s Zuccotti Park, newfangled innovations like the High Line, and Janette Sadik-Khan’s pedestrian plazas. Maybe 15 percent at best? Guess again. When we think about public space, we picture parks and greenways, but overlook the largest single public space asset in any city’s rolls: streets. Include the pavement New Yorkers traverse every day in your public space calculation and the city’s most prosperous borough hits the magic proportion: 49 percent. The problems go beyond traffic snarls, according to the UN researchers, who found a correlation between expansive street grids and prosperity. Manhattan, with 36 percent of its area is dedicated to streets and a booming economy, has the largest street grid in the world thanks to a 1811 plan that prioritized a reliable street pattern. Toronto, Barcelona — where Clos served as Mayor — and London, all economically vibrant cities, aren’t far behind, while younger and poorer U.S. cities like Phoenix and Los Angeles hit the sub-30 percent danger zone. It’s not incidental that Phoenix and L.A. — both car-oriented places that developed with a more suburban form than older cities — have a smaller percentage of their area dedicated to public streets. In these cities and in their suburban peers, large lots and open spaces collude to create a very small overall percentage allocated to streets. Land area dedicated to streets in North America, Europe and Oceania cities. 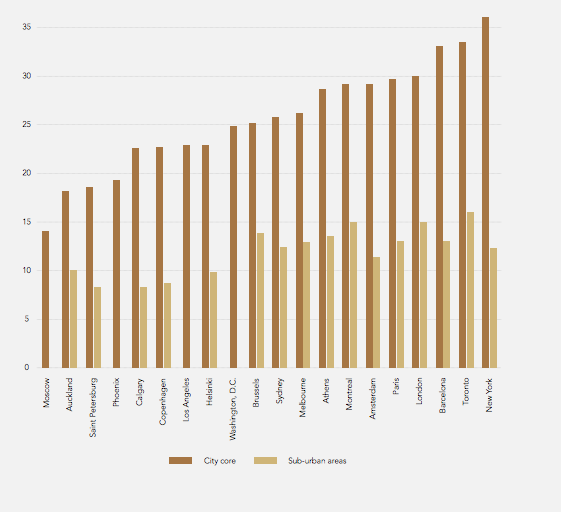 Among cities in Africa, Asia, Latin America, and the Caribbean, the cities with the most area dedicated to streets leaders are Hong Kong, with 34 percent and Tokyo, with 29 percent. Both are economic powerhouses. At the bottom of the street-area rankings, all with under 10 percent: Bangui, Central African Republic; Yerevan, Armenia; and Dhaka, Bangladesh. Clos argues that these cities look more like the Phoenixes of the world than the Manhattans and Barcelonas. 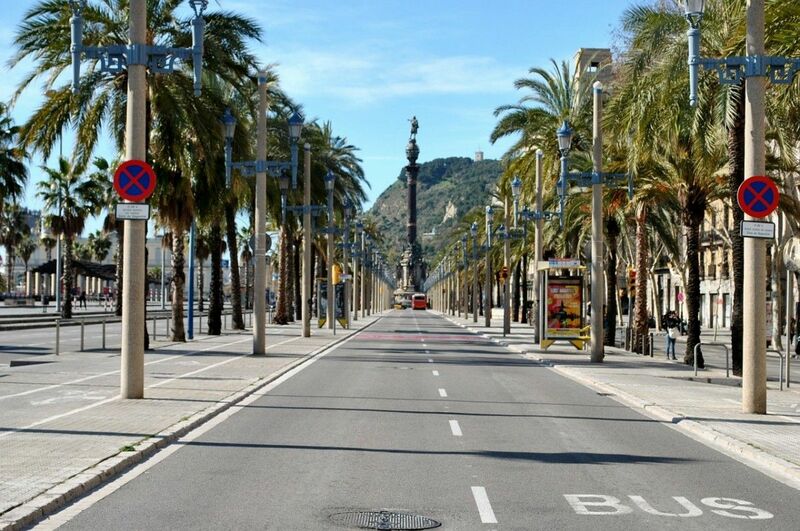 Barcelona has more area dedicated to public streets than most cities. 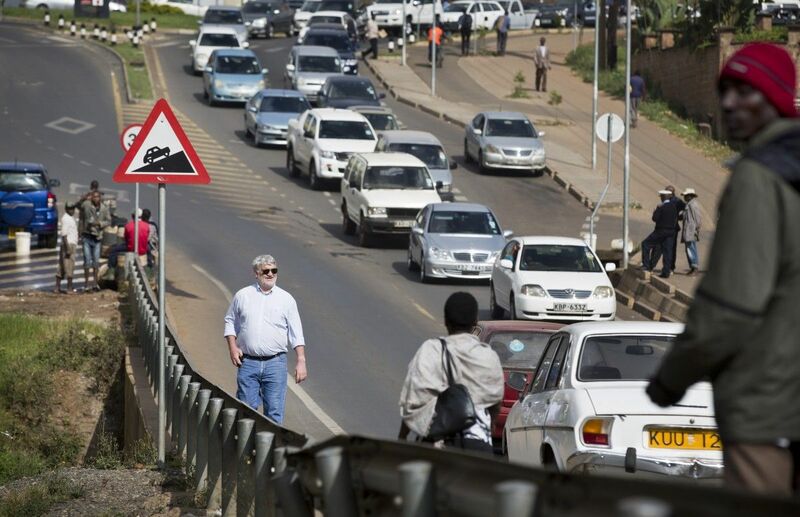 The report cites Nairobi, where four people were killed on Sunday when a six-story building on a densely populated block collapsed, as a specific example of a city without an adequate street grid. There, the number of intersections per square kilometer barely reaches 40 and many streets lack sidewalks. But numbers don’t tell the whole story. Cities still must be conscious of how they use the precious square feet, after all there is a big difference between St. Petersburg, Russia and Ouagadougou, Burkina Faso, even though they have the same scant 15 percent of area dedicated to streets. Clos pointed to perennial pedestrian charmers like his native Barcelona, Vienna, Amsterdam, San Francisco, and Budapest as cities that have their streets enough breathing room and also made sure to design them to support a thriving economy. Even if the Greek economy has fallen on hard times, when Athens was made the capital in 1832, a street plan laid out over the 7,000-year-old city helped transform it from a sleepy city of ancient ruins to a metropolis befitting modern Greece. Laying out the streets, however, is only half the battle. Especially in the automobile era, it’s vital to make sure they serve more than just car traffic and provide a dynamic streetscape for all users. “It is not just the amount of public space, but its quality of potential use, the process through which it is created and owned, and its governance,” says Ethan Kent, Vice-President of Project for Public Spaces. Ultimately, it’s not only about how much a city has by way of streets, but also what a city – and its residents – do with them. The column, In Public, is made possible with the support of the John S. and James L. Knight Foundation.